Web Hosting, Domain and VPS - TLD6.com: Why Should You Choose Windows VPS Hosting ? Today, VPS (virtual private server) has become quite popular in hosting industry. In this type of hosting many physical servers separated into many different virtual servers. This type of hosting service is considered more useful for organizations as compared to other hosting services. Many companies provides windows & linux based VPS hosting platforms. For small to medium sized businesses windows VPS hosting is a best choice. Many service providers provide affordable windows VPS server. If you are adopting this hosting service then you can get services of dedicated hosting. Below mentioned are the some benefits of this hosting platform for your business. Windows VPS hosting is capable to support Microsoft technologies like ASP, ASP.NET & can support MSSQL database. Windows VPS server can work together with MySQL database & PHP scripts. 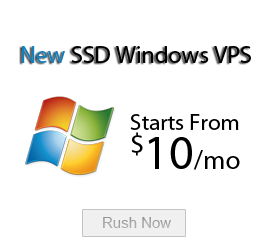 Windows VPS can work with many control panels like DotNet Panel, Plesk panel & website panel. With these control panels it is easy to customize & administrate the server. In this hosting, your service provider manages your VPS & you will get full technical support. All technical issues will be solved quickly by technical professionals. The main benefit of choosing windows VPS is compatibility with many applications & software by Microsoft. This feature makes it very attractive hosting platform for webmasters. Another important benefit is that you have control over the setting over on windows installation with windows VPS. Web hosts will give you full root access to the server which allows you to install any software, application & configuration of your server according your website needs. So this hosting service allows greater flexibility & control. So this hosting will provide dedicated web hosting environment. In windows VPS hosting you get personal server with its own resources. So your website will never be affected by your neighbor websites. Your virtual server performs well, more stable & quick loading time. You will get good processing speed & 99.99% uptime. The best feature of windows VPS hosting is that it comes with Graphical User Interface (GUI). This feature is very User friendly and easy to maintain. Through this hosting a user enjoy hassle free services. So if you want to choose a web hosting option which has high level security, performance & affordable features, then you should go for windows VPS. Windows VPS hosting can fulfill your requirements & deliver the expected results.